Public Security Minister tours south, receives updates on police readiness for possible infiltration by Gaza terrorists. 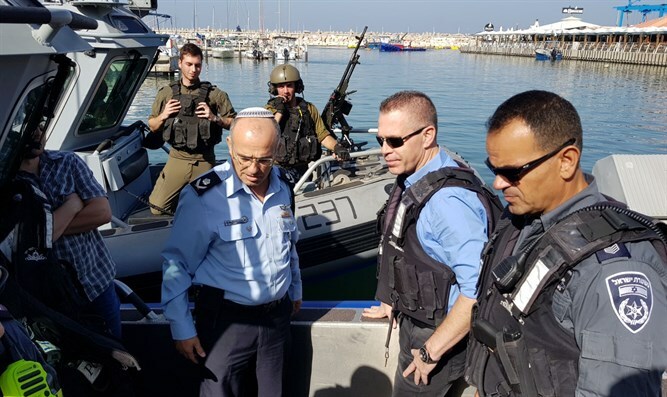 Public Security Minister Gilad Erdan (Likud) toured the south Thursday and was briefed by the police on the preparations for terrorist attacks and extreme scenarios such as infiltration by terrorists from the sea or from a tunnel. Israel has been on high alert recently, especially in the south, following the destruction of a terror tunnel leading from the Gaza Strip into Israel. The commander of the Southern District, Major General David Bitan, took part in the tour alongside Erdan. They examined the level of readiness of the district for scenarios involving infiltration from the Gaza Strip to the Israeli cities and towns in the south. The tour began in Ashkelon, where Minister Erdan joined a special naval commando team on the Gaza border and received an overview of the threat of infiltration from Gaza by sea to the nearby Israeli coast. Later, the minister received a briefing from the officers of the Be'ersheva district on all the existing threats and the readiness of the police forces to respond quickly and efficiently to infiltration by terrorists. "The police are preparing for any scenario that may develop these days, including possible infiltration events not only in the underground medium, but also from the air or from the sea. In all of these scenarios, the Israel Police should be prepared with the highest level of readiness and ability to respond," Erdan said. "I am very impressed by the readiness. There is tremendous progress in the abilities of the various police units to deal with any scenario that Hamas or any of the terrorist organizations will try to harm us, and I am sure that they understand very well that anyone who tries to harm the State of Israel will receive a very, very harsh response not in proportion with what he will try to do," the minister added.